NOTE: I first wrote this post for the Lilly Clinical Innovation blog. It is being republished here with their permission. While these milestones are notable, what’s far more intriguing is how ResearchKit is changing clinical research. After ResearchKit was announced, I wrote a blog post exploring its capabilities through the lens of traditional clinical research. I used this approach to communicate ResearchKit’s capabilities in a familiar mental model, knowing ResearchKit would ultimately require a new model. Now a crisper picture of this new model is beginning to emerge. The lessons of the past 10 months hint at 5 big changes ResearchKit is bringing to clinical research. ResearchKit could help overcome one of the biggest challenges in clinical research – participant recruitment. Within 24 hours of Stanford’s release of the MyHeart Counts app, the study had signed up 11,000 people. The hype around ResearchKit’s announcement undoubtedly contributed to success stories like this one. But there’s no denying that ResearchKit offers unique recruitment opportunity. The ubiquity of the iPhone enabled us to recruit “wide and deep” in a way that would match a far more expensive, national clinical study done in the traditional manner. For our study, 87% of participants live outside of NY and NJ. We found that our participants hail from all 50 states and there is general agreement with prior CDC asthma prevalence data. But sometimes solving one problem creates another. Participant retention has been more of a challenge for ResearchKit apps. Dr. Ray Dorsey, who was involved in development of the mPower Parkinson’s app, indicated that “like with any app, there’s rapid adoption and decay in use.” This decay has caused retention problems for apps like Share the Journey, which studies breast cancer treatment symptoms. Dr. Ines Vaz-Luis, researcher at the Dana-Farber Cancer Institute and member of the Share the Journey team, shared some ways to retain participants. Through the feedback of patients and advocacy groups, we learned that in order to better engage and retain patients, among other changes, we need to reduce the complexity of the language and tasks in the app and develop systems to provide data streams back to participants. Patient retention challenges warrant a deeper dive, but the retention challenges noted by Dr. Vaz-Luiz as being caused by their app may turn out to be somewhat temporary. My suspicion is that as the next 4 changes in research really start to take shape, participants will naturally become more engaged. Also, as understanding of retention deepens, we’ll likely see development of ResearchKit modules with “turnkey” functionality to help researchers retain participants. Now: One of the biggest challenges in clinical research is participant recruitment. New: One of the biggest challenges in clinical research is participant retention. The traditional research model is not participatory. Historically, participants have only been involved in research as the “subjects” of research. Many participants are now demanding greater involvement. For the most part, researchers are listening. But even well-intentioned researchers can struggle with participant inclusion. They don’t always know how to make the traditional research model more participatory. Unlike the other ResearchKit apps, we have a community forum, where people can propose and prioritize research questions in conversational settings, much like Reddit, where you can propose comments, people can comment on those threads, and they can vote them up or down. The benefits of participatory research are pretty clear for participants, but what about for researchers? Most obviously, researchers get insights that they would not have learned independently. Also, participatory research can aid with retention. People place a higher value on things they helped to create, a phenomenon known as the Ikea Effect. And when participants help to design research, it becomes uniquely tailored to their needs and what they value–key ingredients in a retention recipe. New: Participants are involved throughout the research process. Clinical research is rather removed from health care. Because information does not flow easily between research and care, we miss opportunities to create new knowledge. One solution to better integration is the Learning Health System. As Laura Crawford stated in a recent Lilly guest post, the Learning Health System “connects the point of care and research into a seamless and rapid, continuously learning loop.” Like any worthwhile and lofty vision, the Learning Health System will take some time to achieve. In the meantime, ResearchKit can provide benefits similar to those offered by the Learning Health System. One of the great qualities of ResearchKit is that it centralizes the conduct of research. But why stop with research? By centralizing research and care within an app, we can create a “seamless and rapid, continuously learning loop” similar to that envisioned for the Learning Health System. Such a convergence would be a win for medical advancement and all of the people who benefit from it. Now: Research operates independently of care. New: Research and care converge into a continuously learning loop. Clinical research methods have not kept pace with technological advancement. Browse Lilly CI’s History of Clinical Trials timeline, and you’ll see that many “modern” research concepts were invented over a hundred years ago. The concept of double blinding was invented in 1908. That’s the same year Ford introduced the Model T, leading to a revolution in modern transportation. The auto industry is just one of many industries that have changed immensely, while research has changed only incrementally. Researchers don’t have a good way to improve how they do research. Researchers can’t easily learn from each other, and popular innovation models have limited value in research. Mottos like “move fast and break things” may be suitable for social media apps, but not for work involving human lives. One main goal of our study can be described as “Research on Research.” We sought to determine if it is feasible to conduct clinical research using a mobile app on a smartphone. To date, more than 50,000 people downloaded our app and of those, over 9,000 participants have met our relatively strict eligibility criteria and enrolled in our asthma study. We’ve demonstrated the success of electronic recruitment, consent, and remote collection of study data, all accomplished without direct, in-person contact with study investigators. Researchers can not only improve upon their methods, but they can also diversify them, resulting in more tailored research designs. If you compare the first and second generation of ResearchKit apps, you’ll find more diverse research methods in the second. Given the open, modular, and extensible nature of ResearchKit, this evolution could be expected. But it is striking nonetheless. Diversity of methods will likely grow with each generation of apps. Now: Research evolves slowly and researchers have limited methods. New: Research evolves quickly and researchers have diverse methods. Clinical researchers have access to limited data, which means they have a limited view of health and disease. The types of data we collect in clinical research are often the most convenient ones, not necessarily the most useful ones. And then we collect data only intermittently, like during a visit to the research site. These occasional snapshots of narrow data types provide limited health insights. ResearchKit can collect new types of data at more regular intervals, providing a far better view of health and disease. Since apps are not limited by place, time, or other constraints, they are able to collect multi-dimensional data about participants. One of the great hopes for ResearchKit is that multi-dimensional data will yield multi-dimensional health and disease insights. And this hope is already turning out to be reality. The phone lets us measure patients along so many more dimensions than traditional clinical visits. We can start to look at much more personal patterns–to see what actions, activities, emotions affect the day-to-day experience of a disease. For example, it is possible to define a core set of 20 attributes most commonly found associated with Parkinson’s disease, and each patient displays a distinct cluster of these attributes. That distinct cluster can be used both by the patient–to see what modulates the symptoms, or what aggravates them–as well as by the researchers. Now: Researchers and patients have access to limited health insights. New: Researchers and patients have access to multi-dimensional health insights. No one knows exactly what the future of clinical research holds, but the first 10 months of ResearchKit provide some exciting clues. If these changes become pervasive, our clinical research model will look dramatically different. Excitement needs to be tempered with caution, particularly in interventional trials for new medicines. ResearchKit apps have largely been for “minimal risk” observational studies. When testing a new drug, regulations are more stringent, responsibilities are greater, and stakes are higher. We’ll need to carefully consider how to marry the most important principles of traditional research with the innovative new model that seems to be emerging. 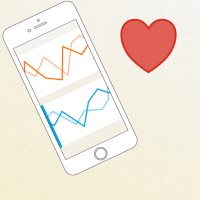 What do you think about ResearchKit and the future of clinical research?